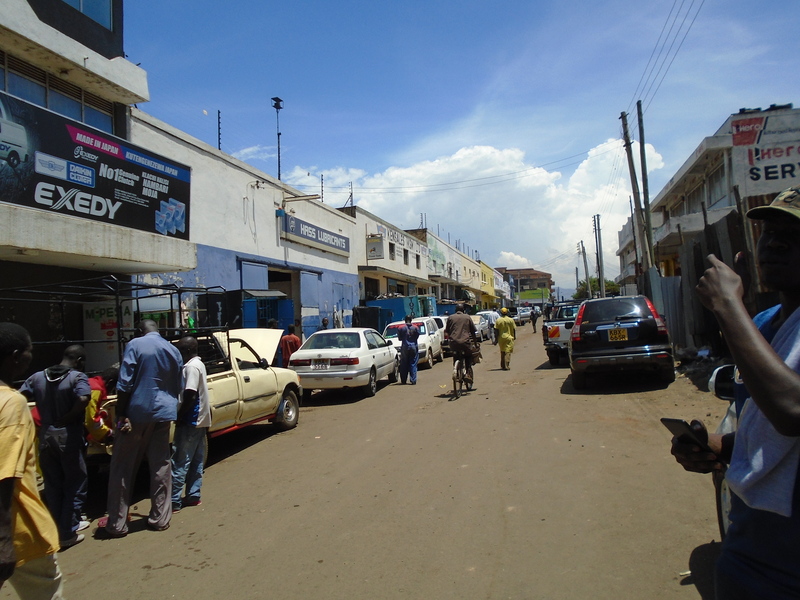 Located in downtown Kisumu, Makasembo Road is an active thoroughfare populated with dozens of stores and is known for its automotive shops that line the street. Our article hopes to identify and chronicle daily life along this important Road in Kisumu City, and, through it, highlight daily life along major roads in the city and other urban centers in the region and Kenya as a whole. We also hope to highlight how the road came to be known as Makasembo Road. 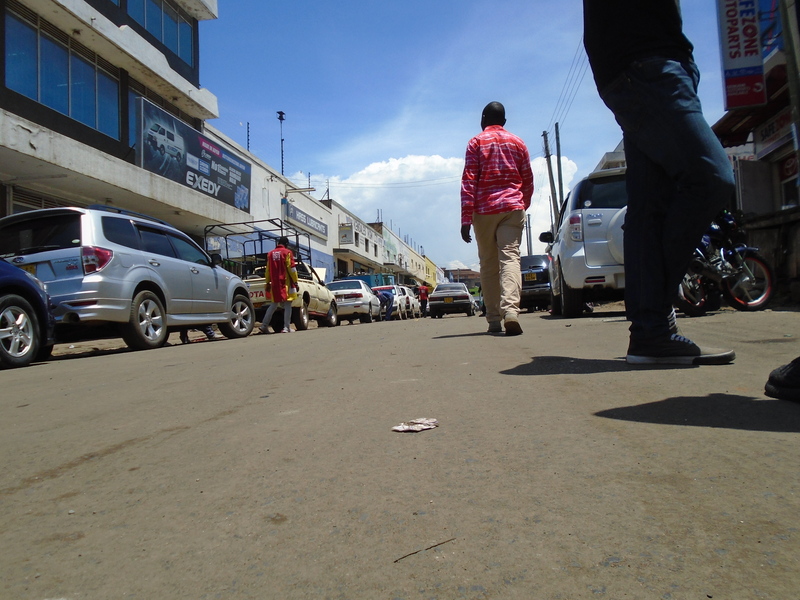 Located in downtown Kisumu, Makasembo Road is an active thoroughfare and is known for the many different shops that are found there. Makasembo Road is a 1.04-kilometer-long road and is bordered by Karume Road to the east, Oginga Odinga Road and Paul Myuba Road to the west, and Accra Street to the south. It serves mainly the informal settlement area of Kaloleni, with a population of about 13,515, putting the population density of 6,436 people per square kilometer, according to the United Nations’ urban sector profile for Kisumu. How did Makasembo Road emerge and get its name? Before Kenya’s independence, the road was known as MacKinnon Road, named after Sir William MacKinnon, the founder of the Imperial British East Africa Company, which was in part responsible for facilitating the colonization of Kenya. However, after independence, certain unfortunate circumstances led to the road being renamed in memorial of Dixon Oruku Makasembo as part of a wider trend in post-colonial independent Africa to rename roads after prominent African figures. Dixon Oruko Makasembo was a member of the Luo ethnic community and senator representing the people in the Kenya Senate in Nairobi. Prior to his work as a senator, Makasembo served in various positions and postings, mostly Luoland. From 1956 to 1960, Makasembo served as Chairman of the African District Association for Central Nyanza. In July 1960, D.O. Makasembo was elected Chairman of the Kenya National African Union [KANU] for Central Nyanza. In May 1963, Makasembo was elected senator for Central Nyanza in the Kenya Senate and was then re-elected to the same position in August 1965. Senator Makasembo served his people faithfully as a dedicated and prominent member of the Kenyan National Assembly during his multiple terms of service. Unfortunately, following his re-election to the Kenya Senate in December 1965, his service to people was cut short when he lost his life in a serious car accident. When eulogized, as recorded by the Kenya Parliament Hansard, the Speaker of the Kenyan Parliament at the time, Sir Humphrey Slade, said he was saddened by the death of Senator Makasembo. Slade noted that Senator Makasembo was a political veteran, with a “leading part in our politics” and that “the country shall miss his wise counsels.” There have been speculations that, instead of an accident taking the life of Senator Makasembo, perhaps he was the target of an assassination, but these accusations have never been proven. Nevertheless, after the death of Senator Makasembo, the Kenyan government decided to honor and memorialize the life of the Senator by renaming MacKinnon Road in Kisumu to Makasembo Road. The road named after Senator Makasembo has since become a major thoroughfare in the heart of Kisumu. Indeed, one of the major landmarks near Makasembo Road is the Jaramogi Oginga Odinga Referral Hospital, the old Soviet-built facility that used to be known as Russia Hospital. It was here that a celebration for the grand opening of the hospital, led by President Jomo Kenyatta, was interrupted by demonstrations from the local people, leading to violence and death among the demonstrators. The demonstrators were out accusing Jomo Kenyatta and his government for orchestrating the death of prominent Luo politicians, including Tom Mboya, and for being out to reduce the influence of prominent Luos in the government, and generally trying to frustrate the Luo in the country. The road, with the hospital standing right next to it, has thus been a marker of “precarious” position of the Luo in the Kenyan state. It was here at the hospital and on the Makasembo Road that there was a literal clash of different ideologies and ideas regarding the future of Kenya in the aftermath of Kenyan independence. Apart from the hospital, there are a number of shops lining along the road. However, when looking at most of these shops, one notices that they are owned primarily by Kenyans of Indian descent supported by a large contingent of ordinary African workers. The reason for this is not simple, but it seems to linked to the British colonial system that came to Kenya in the 19th century and was refined in the 20th century. When Kenya was founded as British East Africa in the 1890s by British colonial officials, one of the major developments in the colony was the building of the Kenya-Uganda Railway running from Mombasa on the Kenyan coast to the western terminus ending in Kisumu on Lake Victoria. To build this railway, also known as the Kenyan-Uganda Line, indentured Indian labor was used. large numbers of Indian laborers, known as coolies, were imported and brought to Kenya to construct the railway. After completing the railway, the Indian laborers were given the option of either returning to India, or staying in Kenya. Many such men decided to stay in Kisumu, becoming middlemen traders in the newly emerging, racially based economic system in Kisumu and Kenya. From this middleman position in Kisumu (with whites on top, Indians in the middle, Africans on the bottom), the Indians quickly became entrenched and established a wide variety of different business ventures, including many that are now prominent on Makasembo Road to this very day: traders, contractors, builders, outfitters, mechanics, and other fields. The Indians hired Africans (especially the Luo) who became part of an unskilled working class of laborers under a system that persists to the present day, and alongwith it, considerable racial strife between them–the Indians and the Africans. As many of the residents of Makasembo Road will tell you, the recessions of the 1980s and ’90s hit the city hard. Many local businesses that relied on the production of sugar were forced to close with the loss of these pillars of income. The stagnation that followed led to a small exodus from the city as many of the companies and farmers that used Kisumu for a trading center were forced to relocate to find different work. This then led to the shutting down of local shops, services, and vendors that were reliant on tending to the needs of those producers and companies, and their reliable source of workers for customers. This led to many notable changes of life along the Makasembo Road. As the old laborers left for the village, new enterprising young men replaced them, intent on making a mark for themselves on the road in the city. Thus, in the modern era, Makasembo Road is changing. 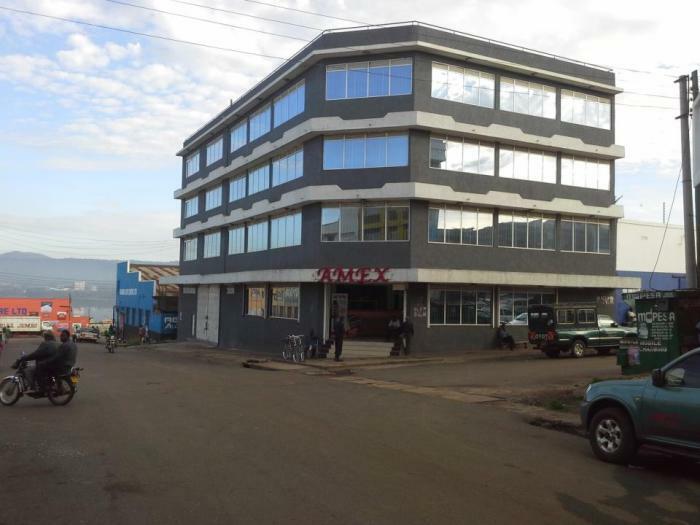 Numerous new businesses, some owned by the local Africans, dot the road, including Kisumu Body Works, Dunga Wholesalers, and Mutismoto Motor Company. These are but a sample of the enterprises providing residents in the vicinity of Makasembo Road not only with critical employment opportunities in a city desperately in need of them, but also connecting Makasembo Road to the wider global economy in a multitude of ways. Kisumu Body Works, for example, helps bring jobs by offering repair services for automobiles–jobs that an area like Kisumu needs. Dunga Wholesalers sells fertilizers while trying to expand in Kenya and internationally. Mutsimoto Motor Company offers quality filtration systems for Kenya and the wider African market. In addition to these, there’s AMEX. AMEX Auto Spares was founded by Manharbai Raojibhai in 1988. Early on, AMEX struggled to stay open. Beset by a long list of problems, that almost seemed to doom the company within a year of its opening, the company, after struggling with seemingly countless challenges, became not only a self-sufficient, but also evolved into one of Kenya’s largest importers of parts and automotive lamps and a multi-city company facilitating trading company between two of Kenya’s largest cities and foreign producers across Africa and Asia. They are based on Makasembo Road. Their next big move is to begin expanding into Nairobi to better serve its customers there including other big businesses like some of the sugar factories around Northern Kenya. In addition to helping build local national businesses like Mobius Motors, AMEX also imports in parts from noted car manufacturers such as Toyota, Honda, Mazda, and others. The rest of the nation can also enjoy parts for 15 different car models through judicious partnerships with Amazon, eBay, and Jumia. Other notable customers and clients of AMEX include Equator Bottlers, Kenya Pipeline Company, and the Kenyan Airports Authority, among others with their finely honed import and distribution networks. As the company leverages its advantageous location from Makasembo Road to Kisumu’s transportation hubs, AMEX can now afford to negotiate between several loan offices and creditors in multiple locations as banks come to them due to their now Top 100 Kenyan business status. Another industry currently on the rise on Makasembo Road is the nautical industry due to Kisumu and Makasembo Road being mere meters away from Lake Victoria. The leading company spearheading this charge is a local company chain with national locations: Captain Andy’s Kenya. Captain Andy’s Kenya on Makasembo Road provides services like metal fabrication, marine training, engine servicing and has become the sole distributor of Yahama parts and supplies, thus providing the local Kisumu residents with a chance at owning big boats after training on how to run and manage them. While Makasembo Road, along with Kisumu and Kenya itself has faced many changes and challenges and throughout its tumultuous history, there is also new life being breathed into it daily. From the outside one might not see it from merely looking at snapshots or from a UN urban profile report. To know about life on this street, one has to take a different approach. One must go beyond the apparent, and visit the road to witness its boisterous, bustling nature, to see and appreciate that, while the legacies of the economic downturns afflicting the area in the 1980s are still there, the scars are healing. Things are happening. Life must go on. The vendors, traders, entrepreneurs of Makasembo Road are proving just that. From the emerging car parts sector servicing with an increasingly global appetite for affordable automobile parts, to cultural events, to institutions providing repositories of knowledge Makasembo has emerged as an important thoroughfare breathing new life of growth in Kisumu. In fact, Makasembo Road itself is a sign of resilience and recovery as Kisumu adapts to being part of the wider world. More importantly, these developments are due to a motivated and savvy citizenry. A citizenry working together despite the fraught colonial racial past working together relentlessly, pushing itself toward a better and brighter future–one that the late Senator Dixson Oruko Makasembo would be proud of. Makasembo Road ~ After arriving at the Kisumu International Airport, one would need to procure a bus ticket or rent a car from the nearby automobile center and continue down the Kisumu International Airport Access Road. Following this road will lead you past a roundabout and onto Mumias road, which will take you to the Kikomi junction where this road becomes Kisumu-Busia road. The Kisumu-Busai road runs parallel to the Lake Victoria shoreline and leads you into the very heart of Kisumu's downtown area. This road is intersected by 7 streets and roads that will take you to Makasembo road, most notably Otieno Oyoo street, another major thoroughfare found in the heart of Kisumu which acts like an artery bringing in fresh blood to Kisumu. Amex Auto Spares. “About Us” Amexautospares.com https://www.amexautospares.com/page/about-us/ (Accessed October 19th, 2018). Captain Andy’s Kenya. “Services” Captainandyskenya.com. https://www.captainandyskenya.com/services/ (Accessed October 28th, 2018). Hakeenah, Njenga. “Mobius Motors resurrects Kenya’s vehicle manufacturing industry producing country’s first ‘Land Rover’”. The Exchange. https://www.exchange.co.tz/mobius-motors-resurrects-kenyas-vehicle-manufacturing-industry-producing-countrys-first-land-rover/ (Accessed September 13th, 2018. Kariuki, James. “Motorcycle firm seeks protection against imports” Business Daily Africa. https://www.businessdailyafrica.com/markets/marketnews/Motorcycle-firm-seeks-protection-against-imports/3815534-4734918-13c1d2o/index.html (Accessed September 4th, 2018). Kenya. National Assembly, House of Representatives. 1966. Kenya National Assembly Official Record (Hansard) Wednesday, January 26th 1966. https://books.google.co.ke/books?id=k-ueqyV5ke0C&source=gbs_all_issues_r&cad=1 (Accessed November 24th, 2018). Koster, Mickie. Kithinji, Michael. Rotich, Jerono. Kenya After 50: Reconfiguring Education, Gender and Policy. Palgrave Macmillan: Basingstoke, 2016. Masdine, Joshua. “A made-in-Kenya vehicle is targeting mass production for Africa’s rough terrain”. Quartz Africa. https://qz.com/africa/875306/kenya-s-mobius-motors-like-uganda-s-kiira-motors-area-to-provide-africa-a-homemade-vehicle/ (Accessed September 12th, 2018). Odhiambo, Moses. “Kisumu spare parts dealer bets on IT to drive global growth”. Business Daily Africa. https://www.businessdailyafrica.com/magazines/Kisumu-spare-parts-dealer-bets-on-IT-to-drive-global-growth/1248928-2880340-view-asAMP-24hkk0/index.html (Accessed September 4th, 2018). Onyango, Protus. “Watch out, Kisumu rogue mechanics on the prowl!” Standard Digital. https://www.standardmedia.co.ke/article/2000121042/watch-out-kisumu-rogue-mechanics-on-the-prowl (Accessed September 4th, 2018).